A Mantra dedicated to Surya Deva or the Sun God to make anyone speak the truth or give correct information or facts has been described in this post. In the Hindi language this Mantra is called as the Sach Nikalne Ka Surya Mantra or Kisi Bhi Vyakti Se Sach Nikalne Ka Chamatkari Mantra. This Mantra has also been attributed with the supernatural power of being able to enable the practitioner to walk on fire or enter a burning place without being burnt or injured. However, I cannot verify this supernatural power as I have not tried this Mantra Experiment nor heard or seen man or woman perform it. The text does not mention if Siddhi or Mastery is essential over the Mantra before attempting to actually practice it to make anyone tell you the truth or to be able to walk on fire. The Vidhi of actually practicing the Mantra for both the purposes mentioned above is most simple and basic. 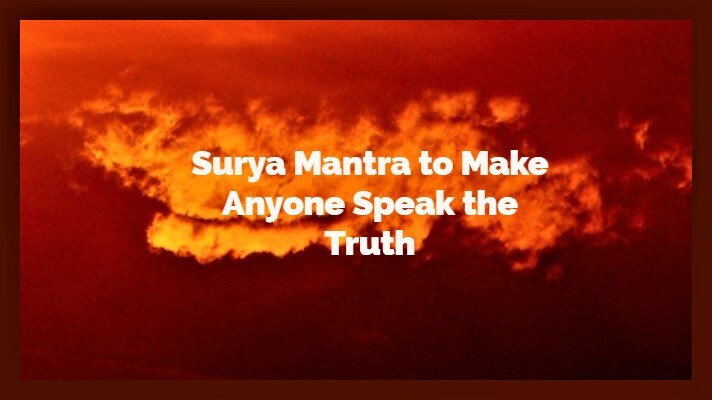 1] To make any person speak the truth – The practitioner has to chant the Surya Mantra given below 21 times and then keep his hand on the forehead of the person whom he wants to speak truthfully of divulge the facts. This simple Vidhi is said to make the targeted person speak the truth. 2] To walk on fire or enter a burning place without being burnt- The practitioner has to chant the same Surya Mantra 21 times before walking on fire or entering a burning place to prevent himself from being burnt. Note- This post has been written solely for giving information as such supernatural powers or Siddhis can only be gained by following secret methods. Hence, kindly do not attempt the second Mantra Experiment, the first one is harmless and can be tried. i just tried this truth one on my brother and all he did was stare at me blankly with confusion and didn't say word apart from : "what are you doing". i think siddhi must be achieved first. Possibly. But did u try d fire experiment? Mr. Sharma, do you have a computer or laptop with internet connection? Many Mantras and Tantras for finding employment have already been given on this site. Do a site search and find a remedy that suits your needs. You can chant the Mantra of your Ishta Devta for clarity and direction. For example- Om Namah Shivaya or Om Namo Narayana or whatever is the Mantra of your Ishta Devta. also how long will the mantra last for being fireproof? I tried the fireproof version of this mantra by chanting 21 times over a lit दिया. My hand still burns. "om shankar har har, agni stambhay sambhay".